The specialised cancer agency of the World Health Organisation, the International Agency for Research on Cancer (IARC), announced today that it has classified outdoor air pollution as carcinogenic to humans (Group 1). Only 111 agents have previously been classified in Group 1. After thoroughly reviewing the latest available scientific literature, the world’s leading experts convened by the IARC Monographs Programme concluded that there is sufficient evidence that exposure to outdoor air pollution causes lung cancer (Group 1). They also noted a positive association with an increased risk of bladder cancer. IARC also said that outdoor air pollution is the most widespread environmental carcinogen. Particulate matter, a major component of outdoor air pollution, was evaluated separately and was also classified as carcinogenic to humans (Group 1). The IARC evaluation showed an increasing risk of lung cancer with increasing levels of exposure to particulate matter and air pollution. Although the composition of air pollution and levels of exposure can vary dramatically between locations, the conclusions of the Working Group apply to all regions of the world. “This is the biggest public health news for a generation. No-one can ignore this. “Declaring ‘particulate matter’ as carcinogenic to humans would have been big news but declaring the whole cloud of air pollution as carcinogenic is a ‘paradigm shift’ in the truest sense. Both forms of pollution have been placed in the top rank of most carcinogenic agents known to humankind. “Until now, scientists have only linked exposures to individual gases, particles or sources of air pollution (e.g. asbestos, diesel exhaust or tobacco smoke) to individual health outcomes like cancer or cardiovascular disease. Declaring outdoor air pollution as carcinogenic means we are no longer fighting a single particle or molecule at a time. “Today’s news will send a seismic shockwave through the media and public awareness and put intense pressure on policy makers and legislators to take action and warn the public with advice for people on protecting themselves and reducing pollution for themselves and others. We may even see the first ‘class actions’. 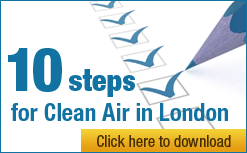 “The Mayor says road transport is responsible for some 80% of particulate matter emissions in London. As his biggest single power and responsibility is in transport, he must act – and act across the board – to reduce these emissions. It is no longer enough for him to say he’ll fit filters to buses to tackle diesel exhaust or start worrying about nitrogen dioxide molecules and tyre and brakewear. “We need to tackle a global problem globally. No single particle, technology or level of Government can fix this problem alone. Everyone must contribute at a local, regional, national, European and global level. From today, we need to work together at all levels of society on all sources, pollutants and exposures to air pollution to tackle a global and all-encompassing problem.